BranchOut‘s story is a brutal lesson about the risk of derailment when you build on someone else’s platform. After raising $49 million and growing to 33 million users, Facebook changed its viral channels leading BranchOut to starve. Now the “LinkedIn within Facebook” wants to throw in the towel. Sources confirm that BranchOut is in discussions with several acquirers in the recruiting space for its main team, product and data, though that may take a little time and the main product will run until then. Right now, it’s in late-stage talks with the Hearst Corporation to sell its mobile team that built enterprise chat app Talk.co. That info is backed up by the fact that Talk.co, which it launched a year ago, was quietly shut down today, and its apps have been removed. BranchOut could find another buyer for Talk and its team, though, and the leak of this news could impact the outcome. BranchOut’s Talk.co would potentially work for Hearst on mobile apps for delivering content from the corporation’s magazines and TV channels. That part of the deal is being shopped for “multiple-millions of dollars,” which might range into the tens of millions said one of my sources, so not a big win. The price for the rest of the team, product, and data is unclear. I’ve contacted BranchOut and it refused to comment. 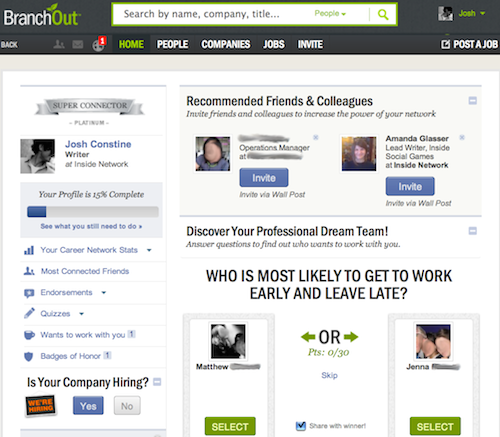 Started in 2010 by Tickle co-founder Rick Marini, BranchOut’s Facebook desktop app was designed to help people find jobs and figure out where their friends worked. It used spammy Facebook wall posts to grow to huge numbers of sign-ups in its early days, eventually reaching 33 million users after adding mobile apps. The chance to compete with LinkedIn and its progress helped BranchOut raise money from Accel, Floodgate, Redpoint, Norwest and Mayfield Fund. A $25 million round in April 2012 brought it to $49 million in capital. But then things went pear-shaped. Few of BranchOut’s users were truly engaged, and the recruitment search tool it planned to make money with never got serious traction. When Facebook banned the spammy wall post method, BranchOut’s churn quickly outpaced its growth and the company deflated. The train tracks were stripped out from under it. In late 2012 it tried turning into more of a feed-focused social network about work accomplishments, but no one felt like bragging about their day’s meetings and milestones. Its core use case was usurped in January 2013 when Facebook launched Graph Search, making it easy to natively see where friends worked. In August 2013 we got word that BranchOut would pivot to workplace chat, which it launched as Talk in October of last year. The cross-platform app let you sign up with a work email address and see a buddy list of your coworkers. You could ping them with one-on-one and one-to-many instant messages, or set up chat rooms. Unfortunately, Talk.co failed to pick up much steam either, as Slack became the new darling of enterprise communication. Now BranchOut is cutting its losses by trying to find its team a new home and sell the data people gave it about where they worked and studied. Overall, entrepreneurs should take away the realization that if you’re dependent on another company, you’re vulnerable. While Facebook supercharged BranchOut’s initial growth and made it easy for people to hand the app their professional data, that reliance turned into an addiction. When Facebook forced BranchOut to go cold-turkey, the withdrawal wasn’t pretty. Building on someone else’s platform requires a tough balance of opportunity and risk, and startups always have to be ready to stand on their own two legs.